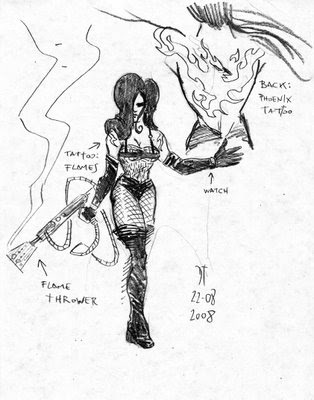 We are running a bit behind on new Mister Crimson episodes so to tied you over I present this early sketch of the Leader by Diego Tripodi. We should have a new episode of Mister Crimson ready to go next week. During the Golden Age, many titles were anthologies featuring one character on the cover, but with multiple characters and stories in the book. In most cases, some of the characters inside the book never got a cover. A perfect example of this is Miss Victory who appeared in the pages of Captain Aero. The original Miss Victory was created in Captain Fearless #1 (Aug. 1941) by an unknown writer and by artist Charles Quinlan in an untitled, five-page story generally indexed with its opening words, "Introducing Miss Victory". She went on to appear in the second and final issue of Captain Fearless, and subsequently in Holyoke's Captain Aero Comics, beginning with issue #1 (Dec. 1941). Given no formal origin story, it was left unexplained as to how Miss Victory was able to survive explosions, break free of ropes, or knock down walls. But is clear that in her introduction she had superhuman strength and durability. She remained as star of a backup feature in the sporadically published Captain Aero Comics through that title's final issue, #26 (Aug. 1946). In 1984, she was revived by writer Bill Black and penciler Mark Heike in AC Comics' Femforce Special #1 (Fall 1984). Now I usually turn a blind eye to the some of the more rediculous stuff I find in these Golden Age Comics. I consider them to be part of the charm of the comics. However, every once in a while, I uncover something that I can't ignore. This is the case with Captain Aero 17, wherein we find a Japanese Ghost pilot. Anyway, in Captain Aero 17, Miss Victory is pursuing a villain who is intent on of Leonardo Da Vinci's secret inventions to win the war. It's an interesting story as it highlights one of the problems with Miss Victory as I see it in that the writers seem to have a hard time pinning down exactly how tough she is. There are posts, articles, and even entire websites popping up all the time regarding digital comics. Some report , some criticize, some generate content , while others provide delivery systems. Something that doesn't get reported on nearly as much, with one exception, is hardware/ software. What will be used to view the digital comics in question. I think it's largely assumed that the iPhone (and other smart handhelds) will be used to do that. Now, and in the future with a rumored iTablet on the way (which will have a much larger screen to view the comics on). "The idea is to get a new type of device into people’s hands for as cheap as possible (we were aiming for $200, it looks like $299 is more realistic). It fits perfectly on your lap while you are sitting in front of the TV, so you can look up stuff on Wikipedia or IMDB as you channel surf. Its unclear at this time whether or not the CRUNCHPAD will allow you to run a few other programs on its hard drive, from an external drive or even a thumb drive (such as a .cbr reader). That fact alone would give the TOUCH BOOK the clear edge for digital comic book fans, particularly with a quick google search turning up little in the way of a web based .cbr or .rar viewer. Rantz Hoseley, the editor behind Image's “Comic Book Tattoo” anthology of comics inspired by Tori Amos, introduced his latest endeavor at Heroes Con this weekend. Longbox, a digital comics platform similar to iTunes, is expected to launch later this year as a free download for Mac, PC, and Linux. Developed by Quicksilver Software, Longbox comics can be download for a suggested price point of $.99 per issue, with the potential for block and subscription pricing. The first two publishers confirmed for Longbox are Top Cow and BOOM! Studios. CBR News caught up with Hoseley to discuss the details of Longbox and its potential impact. 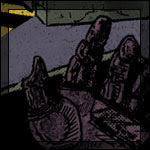 Thank you for stopping by www.carbonatedcomics.com. We are a technology company that is building a way to safely and securely view digital comics and other mixed visual literature. 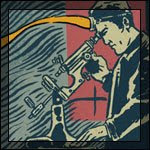 We feature our comic reader (The Carbonator), the Carbonated Comics file format (CCX), and the Carbonated Comics store front for building and selling comics digitally. "The comicsXP Reader is a FREE downloadable software, currently available for windows based platforms, with Mac editions forthcoming. The comicsXP Reader will also bundle with the comicsXP Organizer, for organizing and managing your library. In two weeks we'll discuss digital comics you really should be reading NOW! When you see people who have not released a single project, and they are trying to produce a dozen different comics, a video game, a movie and other stuff…..
Run as fast as you can and don’t turn back. Already, just any one of those things is a pretty big task, and heck a pretty HUGE one when you talk about making a movie or a computer game. So imagine trying to do all of that at once… with little or no budget… before showing that you can finish at least one single comic. Having ambition can be a good thing… but stretching yourself too thin by trying to make too many things at once, odds are that you will not be able to finish a single project. To this day, I don’t even know if the “Dynamos” publisher have even published a single comic, let alone a video game, or any of their other projects. Too much is often just that… too much. And since they had many projects in the work at the same time, they had MANY editors. Each and every one of them wanted to have some sort of say in the creative process even of comics/projects they were not editing themselves. That was a little frustrating to see them all try to add their 2 cents. Especially when some of them did not seem to know what they were doing. At some point, someone asked for some changes because he once remembered reading somewhere that “comic pages should read in some sort of “S” pattern”. He was just vaguely remembering something he once read without really understanding it, but the change he asked for HAD to be made. It would have taken me about 15 minutes to make the change he was asking for… but I decided to draw a line in the sand that one time and said “enough”. “It stops here”. To save a measly 15 minutes? It was to keep them from always making decisions based on something they vaguely once saw or heard once in the distant past. To keep them from asking for changes based on things they did not even understand. And… more importantly, to keep them from changing their mind as the wind blows. Also I wasted some time writing various long e-mails and including various sketches and diagrams explaining the design principles behind what I had done, and heck explaining why what was being asked for did not even work within the “S” pattern theory that was being mentioned. I have worked in the “deciding by committee” approach on various projects, but even then there is a method to follow to make it work. To make it so that at some point you stop making changes and move on to making the next episodes. Otherwise… it is total chaos and nothing gets done. You make the rough artwork. You send the rough artwork to everyone that has a say in the process. You make the changes that are asked for. Then you get the changes approved. Then you make the final work. Once you are past that… too late to make more changes unless you realized some huge mistake slipped through. For example in an episode of Arthur, we had to make some last minute changes because we were using something that the legal department did not get the rights to use. So I tried to explain that people who want to ad their 2 cents must do so at the appropriate time, and that it was a mistake to make a change based on something the editor did not even understand to begin with. But in the end, it was all a big waste of time. Needless to say that it was the end of my involvement in the project. I was still willing to draw the project, but would not make any changes that would be asked for past the “point of no return” unless there was a real good reason to do so. It may not seem like much, but if you keep on making changes and changes as the wind blows, you end up with no project in the end. I have seen many examples of people who are reworking their “perfect” project over and over, but 10 years later, their project is still in their desk drawer because they keep on trying to make it “perfect”. At some point, you HAVE to let it go. You work on it as much as you can within the timeframe that you have… but at some point, you have to say enough and finish your project. So what we had was a situation where some people gave themselves the title of editors thinking that it was giving them all the qualifications that come with the job without any real experience/qualifications themselves. Most of them did not really have a clue as to what they were doing. Heck some did not even know some basic terminology like “worm’s eye view” or “bird’s eye view”. They would use “view from underneath” or “seen from high in the sky”. When people don’t even know some very basic stuff like that… be worried. Okay… maybe not “RUN”. But unless you are prepared to deal with the irritation/aggravation that is sure to follow, as politely as you can, say “thanks…. But no thanks”. Last week, I posted a question to regular visitors of Free Comics Monday asking people how did they feel about Dynamite's stories involving the Golden Age characters. I got the most responses I've ever gotten for a Free Comics Monday post with the majority of people saying they did NOT like the Dynamite stories. Thanks to everyone who posted a response! Today, stepping away from superhero stories for a bit, I would like to call your attention to a great series of articles on the Pigs of the Industry Blog about the work of Charles Biro. Written by RKB, a name familiar to people who read the comments section of this blog, this has been an interesting and informative series I highly recommend if your a fan of the Golden Age. One of the comics mentioned in these articles is Crime Does Not Pay 48, so I thought I'd make today's featured title. Whatever Happened to the Age of Bronze? The Bronze Age died by violence, which some might call fitting, since it had introduced the bloody-handed Conan, and the deaths head emblazoned Punisher to comics. It had it coming, some might say. 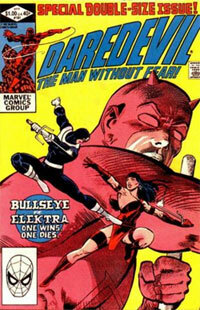 With the first Frank Miller scribed issue of Daredevil in 1981, the world was introduced to the doomed Elektra, Matt Murdock's old college flame. She was now an assassin working with the evil ninja cult, the Hand. In less than twenty issues, she'd be dead, felled by another assassin, Bullseye. Frank Miller's seminal run not only gave us the initial Elektra saga, but also had the Punisher shoot Daredevil, and turned the Kingpin from a pudgy super-villain to a gritty, if larger than life, crime figure. And during all this, people died. Violently. This was to set the tone for the age to follow, where grim and gritty would be the order of the day. The difference between heroes and villains would often be the reasons why they killed rather than anything else. Miller brought this outlook to Batman in a dystopian future (or dystopian present, depending on how you read it) in The Dark Knight Returns (1986)--and once you saw Batman using a machine gun against gang-punks, there was no way you could think you were in the Bronze Age. In many ways, Miller's dark, ninja noir, was just the fulfillment of the dark detective stories Denny O'Neil and Neal Adams were telling with Batman starting in the early seventies. 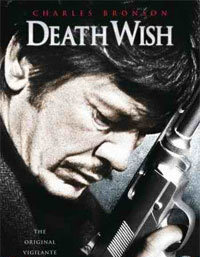 Certainly, the rising "grittiness" of cinema through late sixties into the seventies played a role, with the rise of the Spaghetti and revisionist Westerns, and boundary-pushing, exploitation crime and action fair. This would only continue as popular culture digested and regurgitated TV news images of street riots, and Vietnam. Comic book heroes born in the eighties and early nineties seemed as much the descendants of Charles Bronson's pacifist turned vigilante in Death Wish, Stallone's tormented vet in First Blood, or Schwarzenegger's emotionless killing-machine in Terminator, than of Silver Age Batman or Superman. Men with Eastwood-parody snarls pointing oversized guns, and thin-hipped bad girls wielding big swords, sneered at hippy social relevance and let the ink-black blood flow. Oh Age of Bronze, I knew ye well! I watched you grow out of your awkward Silver Age soap opera adolescence into a mature forum for way out hippy fables. Scribes like Gerber, Starlin, Haney, O'Neil and Brunner took up pen and filled your pages with stories of counter culture idealism and psychedelic imagination. The sweater-vested, buzz-cut Silver Age grew up and went to college and got into political action, racial awareness, longhair, and (shudder) psychedelics. 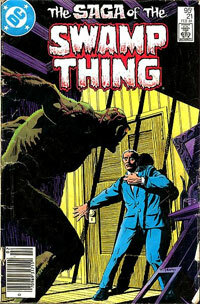 Where before the Thing had fought the Hulk, now Man-Thing fought The Man. Stan and Jack had managed to attract some attention on college campuses by being new and different, and the Bronze Age writers were now taking advantage of this new audience to expand their storytelling horizons. However, like all summer romances, eventually the bloom falls off the rose, and the romance fades. The times changed and the mind altering themes of the 70's began to look quaint in the era of Reaganomics and Punk Rock. The stories that were daring and socially relevant were now quaint and laughable. What did it matter if Green Lantern raised his awareness by road-tripping with Green Arrow, if we still got Reagan, Iran-Contra, and AIDS? Adam Warlock may have pried open his third eye, but you only needed two to see that promises had been made and not kept. A lot of creators--the Punks of the comics world--weren't gonna take it anymore. Enter Angry Young Men from across the pond who would grab the reins to expand on the adult themed stories the 70's writers had initiated. People like Alan Moore, Grant Morrison and Warren Ellis would bring new storytelling techniques to comics they had honed perhaps in the pages of 2000 AD. The first glimpse of this new wave was in Saga of the Swamp Thing #21. There in the pages of "Anatomy Lesson," Alan Moore kicks off the Modern Age of comics with a tale that renews the Swamp Thing mythos (and comics in general) by deconstructing Swamp Thing's origin into a darker, more horrific, that nevertheless opened new vistas to explore. From there, the floodgates for innovation were opened as Morrison, Ellis and Moore would bring ultimately combine big action with big ideas and adult stories. But it wasn't all progress. Sometimes the adult stories were just an excuse for mean-spiritedness; adult situations a gloss on crassness. Punk rock can be just as silly as prog rock when it comes down to it. How often can you be told "everything you know is wrong, before you begin to think nothing's right? For every "Anatomy Lesson" or Animal Man, there was another comic cynically going through the motions. And many decided not to move on at all. In fact, they retreated. Those writers who had been the champions of the socio-political stories either moved on for greener pastures or put aside their leftist leanings to tell more conventional/profitable tales. Instead of insidious governments, we now got Infinity Gauntlets. Theory 3: I Won’t Have You Embarrass Me Like This! From the wackiness of the post-Wertham era 50's to the Schwartz inspired silliness of the 60's comic continuity had collected a large amount of baggage over the decades. While Rainbow Batmen and Lion Headed Supermen were once all the rage, the late 60's saw the beginning of a move away from such zaniness as writers began to explore more serious stories with less emphasis on continuity. One example of this is the advent of the “New Look” Batman. This era of Batman was meant to be a return to the street crime fighting roots of the character, so it's a little ironic that he ended up inspiring the campy version that became so famous on television. Another move to break away from the old stories was the “Kryptonite No More” storyline in Superman #233. However, you can't really shake off the dust of twenty some years of random Kryptonian cousins, criminals and critters all arriving via rocketship with just one storyline. No, to do that requires something much bigger. 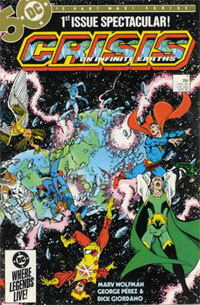 So, it's probably no surprise that DC's answer to the dissonance inspired by years of careless continuity was to simply wipe the slate clean with the multi-issue crossover Crisis on Infinite Earths. Like we were promised, worlds lived and worlds died. Superman wept on a cover, and it wasn't a hoax or a dream sequence. Wolfman and Perez played for keeps. With CoIE, DC shut the door leading to a continuity where Batman's mentally-challenged brother and Beppo the Super-Monkey occupied the same world as Walt Simonson's Manhunter and Denny O'Neil's Ras-Al-Ghul. Or did they? Turns out people like their Legion of Super-Pets, their Batman of Zurr-En-Arrh, and their Ma Hunckle Red Tornado. The door was flung wide again. The old stuff came creeping back, and the new age got just as cluttered as the old. What happened to the Bronze Age? Well...its complicated.. I mean, it got more complicated. In the Silver Age, of course, most comic stories were "done in one" as they say. Two-parters were uncommon, and stories extended beyond that were rarer still. Background storylines were nonexistent. Like Barry Allen on his Cosmic Treadmill, heroes zoomed from one adventure to the next without really ever going anywhere or changing anything in their life. It was usually just a question of what villain would get in their way. In a way, the readers were the ones on a treadmill. This began to change in the Bronze Age. Characters got more of a civilian life, and more of a supporting cast. And the adventures themselves got bigger--the word "epic" began getting thrown around a lot. Hyperbole perhaps, but The Kree-Skrull War in 1971-1972, and the Korvac Saga (1978), were sure more daring in scope than comic's readers were used to. This trend probably reached its zenith with not one but two interconnected sagas in the X-Men. The Phoenix Saga (X-Men vol 1. 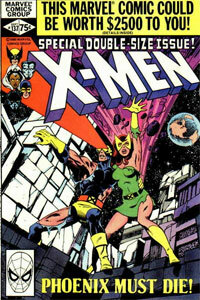 101-108) in 1976-77 gave Jean Grey cosmic power and lead to cosmic drama with The Dark Phoenix Saga (#129-138) in 1980. When it was over, an X-man was dead--and maybe so was the Bronze Age. Or at least, it was on life support. In any case angst and tragedy had been made a core ingredient of the X-men storytelling style, and would remain so for over a decade (and perhaps forever). X-Men would emerge from near cancellation in the Bronze Age to being a hot property in the age to follow. Its storytelling style of long storylines, convoluted back-stories, and soap-operatic overtones would be copied by numerous titles and creators either entranced by its style--or trying to recapture its popularity. So there you have it. The Bronze Age wrote "to be continued" one time too many, until one day....it wasn't. Editor's Note: This is Part 2 of Pierre's experience working on a project called Dynamo's. If you missed last weeks installment, you can Click here to read Dynamos Part 1. Last week I mentioned that after all the design work I did on the Dynamo characters, that the first issue ended up featuring none of them. Instead, it featured this lion-like dude which I kept on referring to as lion-dude, so much so that I completely forgot his name. I am sure that I still have the script somewhere on a CD, but I have hundreds of CDs and just not the strength, and time, to look through all my disks for his name. So let’s settle with calling him “Lion-dude”. I kind of liked the story with Lion-dude and could almost imagine him as Jack Nicholson in “Chinatown”. Love that movie. So I was trying to channel Jack’s character in “Chinatown” as I was drawing Lion-dude. No he did not look anything like Jack. Heck I did not want him to look like Jack. But I was hoping to make him “feel” like Jack does in “Chinatown”… if that makes any sense. Here are the character sketches for Lion Dude. One thing that often happened in my career, when I was starting in animation, or heck when I was trying to break into animation, I was often told that my work was too “comic-book” looking. Ironically enough, when doing comics, I often hear that my work “looks too much like animation”, or in some specific example like Lion-dude when he is in his lion persona, looked too “Disney-like”. As I read an early draft of the script, I made this rough sketch of a page to try to capture the “Chinatown” feeling I was aiming for. Followed by various pages from the first story. I opted for showing a mixture of rough sketches and finished pencils. But sadly, this project went down the drain. This was a case of people trying to do too many things, and too many cooks in the kitchen. They hadn’t published a single comic yet, but already they were developing multiple comic lines (super-heroes, fantasy, etc), video games, and other stuff I can’t recall. Next week I will show you some more actual pages from the comic and explain why the project feel apart. What to do with Public Domain characters? That's the big debate over here at Flashback Universe. I suspect if Pierre had his way, we'd be cranking out new issues of Catman or the GA Daredevil. I'd be curious to know if any fans of the current Project Superpowers series are Golden Age comics fans as well? Do people who like to read the adventures of the new versions seek out the Golden Age stories? If you are a regular here on Monday, let me know what you think of the new stories Dynamite is putting out. Today were going to go over some of the tools that every Digital Comic Book Publisher/Creator/Provider should think about keeping handy, like in an on line tool box ready to open up and go to work when they are ready to release their next comic. Not everyone has/uses Adobe Photoshop or other advanced image editing software. Some comics are still done with pen & ink and then scanned in when everything is just right. This tool will allow you to watermark those images you put online that can be downloaded for free rather than purchased through your web sites store. Your web site does have a store...right? WaterMark.ws is a modern tool that allows you to watermark your photos online. The power of this tool outperforms every other downloadable watermark software on the market. It offers features like batch processing, resizing, image compression, text and image watermarking with transparency and organizing your photos just to name a few. No download. No installation! You'll want one, you know you will. They're just so damn cool. Glicker will set you up with the first half of your trailer: the animation. Gickr.com lets you instantly create Animated GIF online, free, right now! Just upload pictures or grab them from your Flickr. Looplabs will set you up with the second half of your trailer: sound. Putting your digital comic online just isn't enough. You've got to let the world know all about it as well. That means icons, tags, banners, email signatures and more. Why not let HYPLET.com take care of it all. for a small screen. In just minutes, create a mobile view of your website, improving its compatibility with thousands of devices. MOBIFY provides a high quality, effective mobile strategy while maintaining your brand, domain and site structure. Although I was not really told why the “First Ladies” writer left with his project, I agreed to work on something else. Once again, in the hope of getting my name out there. I did not expect any promises of a share in future profits to pay off. But I figured that if I can get at least some exposure out of this… why not? So I got started to design the various characters. With First Ladies, there were 12 “First Ladies” to design, plus various other characters. Although there weren’t as many “Dynamos” to design, what was needed was a young version of the characters that would be set in the past in various flashbacks or other stuff like an old photograph for example, and an older version for the present time. There already was a design for one of the characters, and I tried to make the other members of the Dynamos team to match a little with the already existing design, but still keep each design distinctive. I did not want to give them a “team uniform”, but I still wanted to create some sort of unity between each members. In most cases, all I was given was the name of the characters to come up with the designs. So I included some of my own ideas into the mix. At some point, I started wondering why someone like Captain America did not have Iron-Man’s armor. It seemed that the “super-soldier” would be even more “super” with a high tech suit of armor. So at some point I started to wonder about how the “super-soldier” program could have evolved into the “Iron-Man” program at some point. Since I don’t waste anything, I always am prepared to re-use some older stuff that I made, or ideas that I had. Then I just tried to make the rest of the team match with what I had in mind. Ironically enough, the first story did not feature the “Dynamos”…. At all. In which we learn the origin of his amazing pills!